As you all know – I’m planning a 10,000 mile epic adventure with 3 other travel bloggers across Europe to Mongolia this summer via the Mongol Rally. The idea of the Mongol Rally hatched last year when I came across a career break couple who were taking the plunge into the rally in the summer of 2010; Lauren and Mike from Abandon the Cube. I reached out to interview the couple and shared it on my blog last March. You an revisit that ‘before’ interview here. 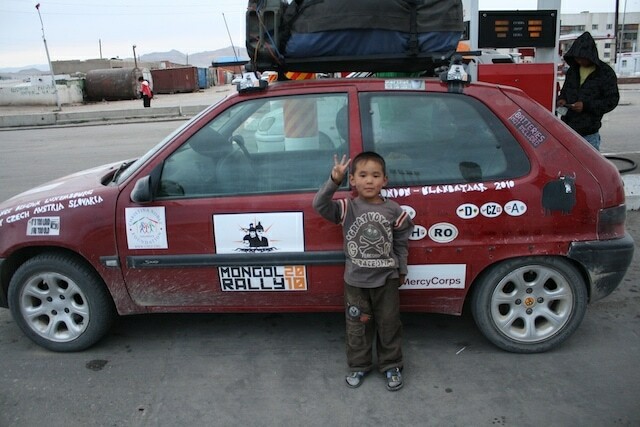 That post was the pre-mongol rally interview; after following them this summer across Europe to Mongolia – I was excited to do a post-interview to see how it ’really’ went. In addition, they have also served as great resources so far for my own team planning for 2011! I honestly wish I could have about 4 hours face to face with them (while drinking a beer of course) to ask them the millions of questions I have regarding getting a car, the proper paperwork, supplies, sponsor, routes, dangers, and sites. Our own team is well aware of the challenge and dangers we have ahead of us, and being able to talk to Lauren and Mike about it is a huge help!